Home Health Bill Health Bill Clears House Panel in Pre-Dawn Hours..
Health Bill Clears House Panel in Pre-Dawn Hours..
WASHINGTON — The critical House Ways and Means Committee gave a pre-dawn approval on Thursday to a major part of the Republican plan to repeal and replace the Affordable Care Act, moving Republicans a step closer toward a full vote on the measure over the growing opposition of senators, health care providers and some conservatives. Republicans on the panel held together and rejected a variety of Democratic amendments while doing little on their own to change the health bill. Many of the amendments were drafted to make Republicans look heartless or rash, forcing Republicans to cast votes that could be cited in campaign advertisements in next year’s midterm elections. The Ways and Means Committee finished approving its portion of the legislation after 4 a.m., nearly 18 hours after it began its work on Wednesday. Another panel, the Energy and Commerce Committee, was still at work on its review of the legislation. I want to see the Trump rallies with stadium size crowds chanting "Cut Our Throats!, Cut Our Throats!...." Influential groups representing hospitals and nurses came out on Wednesday against the Republican bill, joining doctors and AARP, the association of middle-aged and older Americans, to warn that it would lead to a rise in the uninsured. The hospitals and the American Nurses Association joined the American Medical Association and AARP, which rejected the bill on Tuesday. 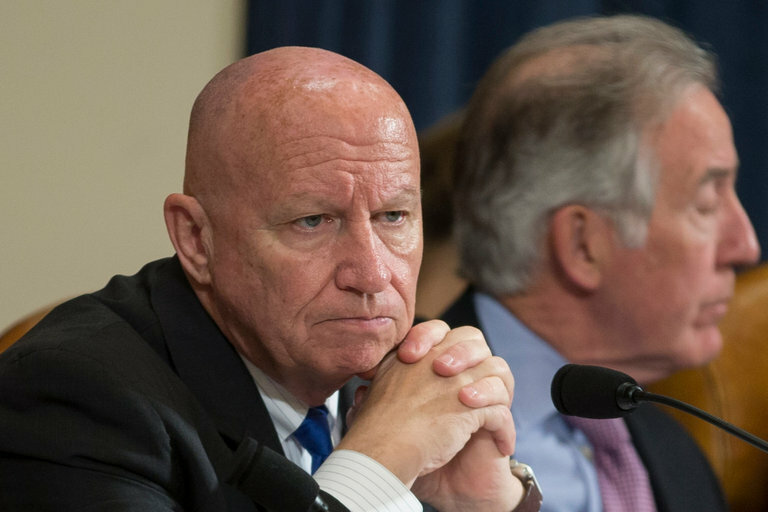 House Republicans have been left scrambling to marshal support from businesses and other interests that stand to benefit from lower taxes if the bill passes. Insurers are on the fence, and other powerful forces like pharmaceutical companies remain largely on the sidelines. Squeezed between wary health care providers and angry conservatives who say they believe that the bill leaves too much of the Affordable Care Act in place, the Republican leadership and President Trump appear to be facing an uphill climb. Senators from both parties continued to lodge their opposition. Senator Tom Cotton of Arkansas, a conservative Republican who has largely stuck with leadership, took to Twitter on Thursday morning to voice his concerns. Among other proposals, Republicans on the Ways and Means Committee turned back Democratic amendments requiring that people not lose health coverage under the Republican legislation and that the plan not increase out-of-pocket costs for older people, a critical issue for AARP. The consideration by the Ways and Means Committee amounted to a procedural step on the way to a full House vote on the health plan. Hour after hour passed with Democrats airing their grievances about the legislation and offering symbolic amendments meant to get Republican members on the record about their views. The White House appears increasingly confident about the prospects for a health care overhaul to pass in the House. In a meeting with conservative leaders in the Oval Office on Wednesday, Mr. Trump said he anticipated the most trouble in the Senate, where moderate and conservative lawmakers are opposing the plan for different reasons. He said he was prepared to pressure holdout senators by holding the kind of stadium-style rallies he led during his presidential campaign. The Energy and Commerce Committee worked through the night and was still at work when the sun rose shortly after 6 a.m. on Thursday. The committee rejected a Democratic amendment to preserve a part of the Affordable Care Act that provides low-income people with financial assistance to help cover deductibles, co-payments and other out-of-pocket costs for health care. The Republicans’ bill would eliminate these “cost-sharing reductions,” starting in 2020. Republicans said the Obama administration had spent billions of dollars on these subsidies even though Congress never appropriated money for the purpose. The Republican bill provides money to states that they can use to make health care more affordable, they said, and states could, if they wished, use those funds to help people with out-of-pocket costs. The committee also rejected an amendment to eliminate a provision that would replace Medicaid’s open-ended entitlement with a per-beneficiary allotment of federal money. The array of groups taking strong positions against the bill is evidence that its potential consequences extend far beyond health insurance coverage, to much of the nation’s economy. The opposition is also a powerful reminder of how many past efforts to overhaul the American health care system failed because of resistance by major interest groups. Winning the support of the health care and insurance industries allowed the Obama administration in 2010 to push through the most significant health care legislation since President Lyndon B. Johnson’s Great Society. Within a few months after President Barack Obama took office in 2009, his administration had lined up support from health care providers, insurers, consumers and drug makers by offering a grand bargain: The health bill would include a requirement that most Americans have health insurance, providing millions of new customers through the law’s often substantial premium subsidies and its option for states to expand Medicaid. In exchange, hospitals would have to accept spending cuts and the health care industry would have to accept new taxes to pay for the legislation. The Obama White House dedicated enormous effort to win pledges of support before Democrats even put out a bill — an effort not replicated by the Trump White House or Republican leaders in Congress. But the Affordable Care Act also created an array of taxes that the Republicans now hope to wipe away, helping them win the support of groups like the United States Chamber of Commerce and Americans for Tax Reform, led by the anti-tax activist Grover Norquist. The congressional Joint Committee on Taxation issued estimates this week showing how much revenue the government could lose starting in 2018 under the Republican bill, which the party has called the American Health Care Act, as a result of repealing taxes on drug makers (nearly $25 billion over 10 years), insurers (nearly $145 billion), makers of medical devices (nearly $20 billion) and high-income households (more than $270 billion from taxes on earned income and investment income). “The American Health Care Act repeals the medical device tax, which will result in greater investments in medical cures, lower health care costs and more high-tech manufacturing jobs in communities across the United States,” trumpeted the Medical Device Manufacturers Association. The extent to which these groups mobilize on behalf of the Republican bill may help determine whether it succeeds. For now, the supporters of the House bill seem badly outgunned by opponents. On Wednesday, as two congressional committees took up the Republican repeal-and-replace bill, the American Nurses Association and the coalition of hospital groups came out against the proposal. America’s Health Insurance Plans, the health insurance lobby, released its own lengthy statement on Wednesday. In a letter to the leaders of the House committees that drafted the bill, Marilyn B. Tavenner, the group’s chief executive, warned Republican leaders that their plans to change Medicaid financing, among other things, could harm coverage and care. While many insurers have lost money in the Affordable Care Act’s private insurance marketplaces, they have generally profited from the expansion of Medicaid, which would effectively be phased out under the Republican plan. A day earlier, AARP, which is another crucial supporter of the Affordable Care Act, had declared its opposition to the bill and had even started running an ad against it. In a letter to Congress, the group said the bill would increase health costs for people ages 50 to 64, could lead to cuts in Medicaid coverage of long-term care and would allow insurers to charge older people five times as much as younger ones. The hardening resistance complicated the case for the Republicans as they moved their bill forward on Wednesday. But, he noted, those groups supported the health care law in 2010. “Hospitals have done quite well under the Affordable Care Act, but my constituents have not,” he said. “Their premiums are going up. Their deductibles are high.”Across the rotunda, Republican senators were less enthusiastic. Senator Shelley Moore Capito, Republican of West Virginia, said she was not certain that a delay in the rollback of Medicaid coverage was “enough for me.” Senator Lisa Murkowski, Republican of Alaska, expressed alarm that the bill’s tax credits would not account for higher premium costs in insurance markets like hers, a largely rural state with little competition. Senator Marco Rubio, Republican of Florida, said he did not want states that took the Medicaid expansion to “get a benefit” that the states that rejected the program did not. “I want to make sure Florida is treated fairly,” he said. Senator Susan Collins, Republican of Maine, said she was unhappy that the bill removed money for Planned Parenthood. There was also a creeping concern about how quickly the bill was moving. Senator Mitch McConnell of Kentucky, the Republican leader, essentially promised to move the bill to the floor without the hearings and other processes that are normal for such a far-reaching piece of legislation. He had promised when Republicans took the majority that they would honor normal Senate processes and traditions.